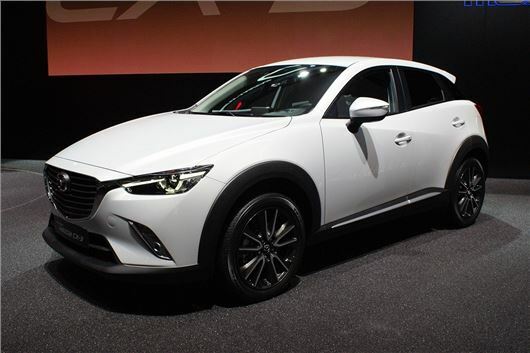 Mazda has chosen the first day of the Geneva Motor Show to announce the UK pricing and specification of the new CX-3 compact crossover – which, starting at £17,595, is closer in price to the Nissan Qashqai than the Nissan Juke it competes with for scale. The car makes its European debut at the Geneva show today. While base model prices don’t often tell the whole story, Mazda is clearly pricing the CX-3 as a premium product, banking on its high standard specification and a couple of technological firsts in the sector to make it stand out. A five-level trim hierarchy comprises SE, SE Nav, SE-L, SE-L Nav and Sport Nav, with a top-of-the-range model costing £24,695 OTR. The CX-3 comes in both front- and four-wheel drive, while standard equipment includes a seven-inch touchscreen infotainment system, DAB radio, Bluetooth, 16-inch alloy wheels, air conditioning and heated power folding mirrors. Trims with the ‘Nav’ suffix add, as you’d expect, satellite navigation. SE-L models add rear tinted windows and LED front fog lights, while Sport Nav models have full-LED headlamps and a head-up display – both firsts in the segment, says Mazda. That car sits on 18-inch machined alloy wheels and, like SE-L, has heated front seats, automatic climate control and rain-sensing wipers; clearly, price and equipment are two areas Mazda hopes will sway buyers towards its latecomer to the crossover party. Manual and automatic transmissions are available, with a 2.0-litre petrol engine coming in two states of tune: 120PS and 150PS. For now there’s only one diesel, a 1.5-litre with 105PS that debuted in the Mazda 2, which in the CX-3 with front-wheel drive returns 70.6mpg and 105g/km CO2. The Mazda CX-3 officially goes on sale in the UK on 19 June 2015.